WASHINGTON (CNS) — Sometimes in the entertainment industry, it’s not always easy to tell who’s Catholic and who’s not. One who is, most definitely, is Stephen Colbert, the new host of “The Late Show” on CBS, taking over from David Letterman, who had his swan song in May. While it should come as no surprise to fans of Colbert, the comic talent is reaching an audience now about three times what it was when he reigned supreme over “The Colbert Report” on cable’s Comedy Central channel. There, Colbert had his occasional comic riffs on Catholicism — almost everything on the show was a comic riff given Colbert’s persona as a pontificating pundit of the bloviating blowhard variety. But “The Colbert Report” even had its own chaplain: Jesuit Father James Martin, who would appear on the show from time to time. It’s that kind of integration of faith and life that makes Colbert distinctive. He’s not the only Catholic on late-night TV; Jimmy Fallon of the first-in-the-ratings “Tonight Show” went to Catholic grade school and college, and having been an altar boy, he had even considered becoming a priest. But while Fallon riffs from time to time on his faith and the church, it’s not with the same all-in sense evidenced by Colbert. That may explain how Colbert could conduct such a riveting interview with Vice President Joe Biden, another Catholic, on the first week of his new show. Biden, still mourning the death earlier this year of his son Beau, intermingled talk about his faith and his loss after being asked by Colbert about his potential presidential aspirations. Being across the desk from Colbert gave Biden a safe space to talk about his faith without being ridiculed or used as just more comic fodder. It also may explain how Colbert could get away with having “Catholic Night” on his show Sept. 24, the date Pope Francis arrived in New York City as part of his six-day apostolic journey to the United States. If Colbert can’t get the pope, then why not Catholic voices? 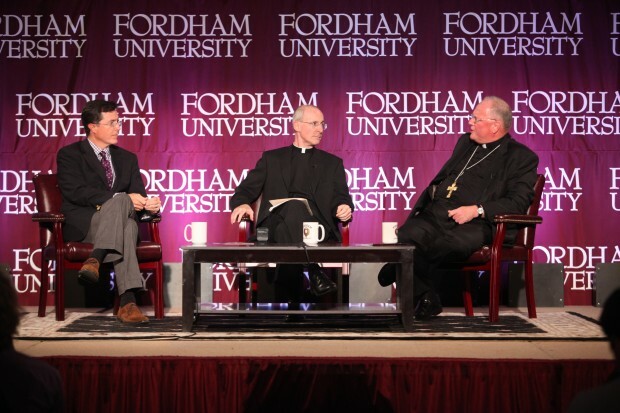 His guests happened to be comedian Jim Gaffigan, whose own sitcom on the TV Land cable channel makes no bones about his faith; Maria Shriver, a member of the Kennedy political clan; author Andrew Sullivan; and Archbishop Thomas G. Wenski of Miami, chairman of the U.S. bishops’ Committee on Domestic Justice and Human Development. Which brings us to another point. It’s not as if doing an interview for a religious cable channel in Canada is going to do anything to boost Colbert’s ratings — or, should his show tank Stateside, that CBS would let him continue to use the Ed Sullivan Theater to make a show just for Canadians, who make up less than 10 percent of the U.S. population. All this points to Colbert’s unique place as a Catholic layman toiling in the field of entertainment, not using profanity and being respectful to guests instead of making them look bad to make himself look good. Now if that’s not one of the corporal works of mercy, I don’t know what is. Pattison is media editor for Catholic News Service. Follow him on Twitter: @MeMarkPattison.